COMMUNITIES across Yorkshire are still mopping up after the terrible floods that blighted the Christmas holiday.In times of adversity, Diary is always heartened to hear of community groups who are doing their bit to help those in the eye of the storm.Volunteers from the Ahmadiyya Muslim Youth Association UK (AMYA) rushed to the scenes of flooding to support those in greatest need.Apart from helping homeowners, they have also worked to ensure that businesses can get back on their feet as quickly as possible. 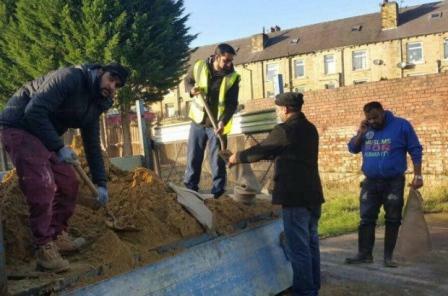 A spokesman for AMYA told Diary: “Youths from as far afield as London have travelled to the North to help in the relief and clean-up efforts. “They have been met with great appreciation and open-heartedness.”The youths have undertaken a variety of vital tasks, such as carrying out repair work on damaged homes and cleaning drains clogged by debris in town centres.“The youths have travelled at their own expense, and with limited resources, and have worked alongside other volunteers and members of the armed forces,’’ the AMYA spokesman said. “However, this is not the first experience of flood relief for most of the youths, as a great number were also involved in the flood relief of 2014.“The youths have emphasised the importance of unity within communities in testing times such as these.”All for Tommy’s The manager of Leeds Building Society’s Halifax branch is busy pounding the pavements during miserable winter weather for a cause very close to his heart. Despite saying “never again” after taking part in the Edinburgh Marathon last year, Damien Briscoe is now training for April’s London Marathon and fundraising for Tommy’s, the charity which funds research into pregnancy problems and provides information to parents.Mr Briscoe is also taking part in the North London Half Marathon in March, which finishes at Wembley Stadium, as part of his training. He began his fundraising for Tommy’s by taking part in the 2015 Great North Run. Salford Lads Club has unveiled a unique piece of art which captures the famous club’s entire history.Displaying the names of 22,500 members ranging from when the recreational club was founded in 1903 until August 2015, the ‘Wall of Names’ has been laser cut from steel by Barnsley-based Cutting Technologies.Notable figures include Fred Done of BetFred, Manchester United Busby Babe Eddie Colman and Exeter City footballer Brian Doyle, Great Britain Rugby League captain Charlie Pawsey and Stephen Wright, the photographer of The Queen is Dead album cover by The Smiths which was photographed outside the venue. Cutting Technologies laser cut 60 panels which will cover an entire side of the club’s new archive room which contains hundreds of photos, film reels, records and memorabilia collected throughout the years.Jane Robinson, director and co-founder of Cutting Technologies, said: “This was a fantastic project to be involved in.“To see all of the names on the wall really brings home how influential places like Salford Lads Club can be in the community.”In 2007, Salford Lads’ Club came third in a nationwide poll to find Britain’s most iconic buildings. Share the post "Business diary: Youths digging in after the floods"